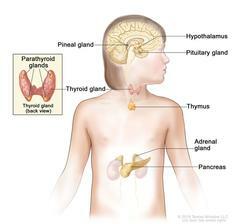 Anatomy of the endocrine system; drawing shows the hypothalamus, pineal gland, pituitary gland, parathyroid gland, thyroid gland, thymus, adrenal gland, and pancreas. Anatomy of the endocrine system. The endocrine system is made up of glands and organs that make hormones that control many important functions in the body. These include the hypothalamus, pineal gland, pituitary gland, parathyroid gland, thyroid gland, thymus, adrenal gland, pancreas, and the reproductive organs (ovaries in females and testes in males), not shown.